Map showing the general expedition operating areas, outlined in turquoise. The purple outline denotes the boundaries of National Marine Sanctuary of American Samoa. Geographic features and areas of interest are also labeled. Image courtesy of NOAA Office of Ocean Exploration and Research. Download image (jpg, 56 KB). From April 4-21, 2017, NOAA Ship Okeanos Explorer will conduct mapping operations 24 hours per day using the ship's state-of-the-art suite of sonars focused on mapping the seafloor, the water column, and the sub-seafloor. This expedition, as part of the NOAA Office of Ocean Exploration and Research's (OER) Campaign to Address Pacific monument Science, Technology, and Ocean NEeds (CAPSTONE), is the second of two Okeanos Explorer cruises focusing on exploring the waters of American Samoa and Samoa, and is the first of two Okeanos cruises focusing on exploring the waters of the Cook Islands. As NOAA Ship Okeanos Explorer moves between the world's ocean basins based on input from the scientific and ocean management communities, the ship is always mapping, thus generating a legacy of high-quality mapping datasets to provide a foundation of baseline information to help ocean scientists and managers better study and steward deep ocean ecosystems. The scientific and ocean management communities are interested in obtaining seafloor mapping data over numerous prominent geologic features in the area. 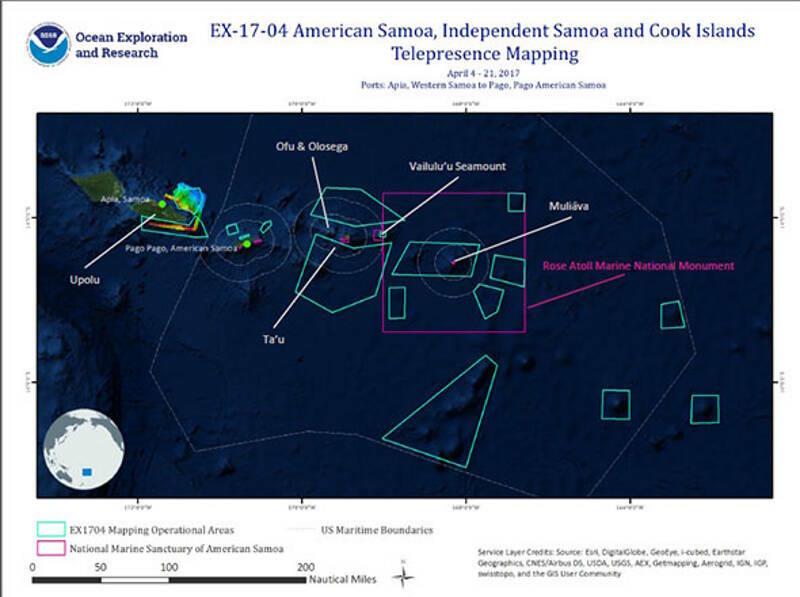 As shown in the mission map above, one major focus area for the cruise will be mapping several seamounts in and around National Marine Sanctuary of American Samoa and Rose Atoll Marine National Monument. Mapping operations near Ta'u, Ofu, and Olosega will focus on high-definition mapping of island flanks to explore submarine landslides associated with the sharp vertical cliffs along the islands' coastlines. A second major mapping focus area is deep flanks on the north and south sides of the island of Upolu in Samoa. These areas have little to no sonar mapping data available. A plume of bubbles is shown rising from the seafloor at Vailulu’u Seamount in the mid-water multibeam sonar data, collected during the 2017 American Samoa expedition. Image courtesy of the NOAA Office of Ocean Exploration and Research, 2017 American Samoa. Download larger version (jpg, 359 KB). During the previous 2017 American Samoa Expedition: Suesuega o le Moana o Amerika Samoa expedition, conducted in February 2017, the location of an active bubble plume in the crater of Vailulu'u Seamount was discovered using the Okeanos' multibeam sonar. During this cruise, a follow-up CTD cast will be conducted at the plume site, including water sample collection at various depths directly above the site and at a control site several miles away. The water samples will be analyzed for metal and organic content by partner scientists at Lehigh University, and the results will be made publicly available. Telepresence uses modern computer networks and a high-bandwidth satellite connection to enable remote users to participate virtually in ocean research and exploration cruises. OER has been leveraging telepresence capabilities since the early 2000s. Through telepresence, remote users have provided support for operations planning and execution, troubleshooting hardware and software, and data interpretation during exploratory ocean mapping and remotely operated vehicle missions led by OER. 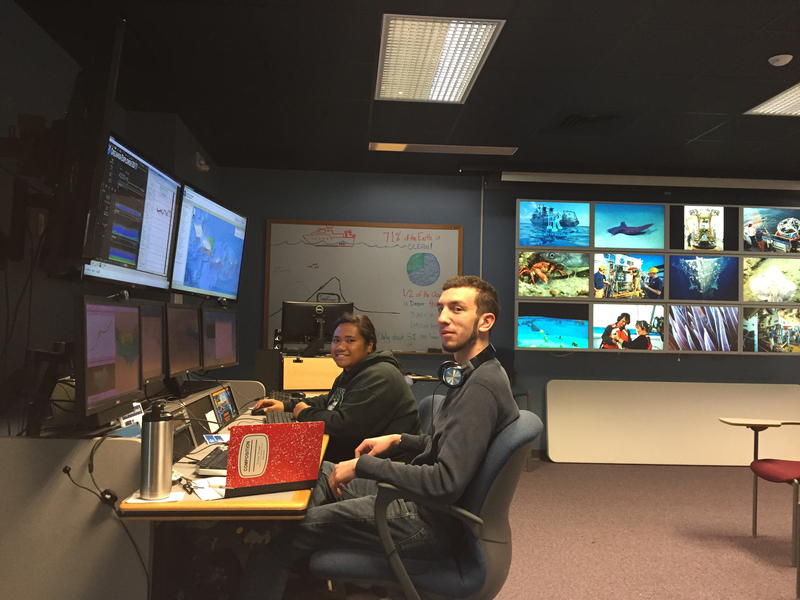 Explorers-in-Training Brandon O'Brien and Claudia Thompson hard at work in the Exploration Command Center at the University of New Hampshire's Center for Coastal and Ocean Mapping. Image courtesy of the NOAA Office of Ocean Exploration and Research. Download larger version (2.9 Mb). 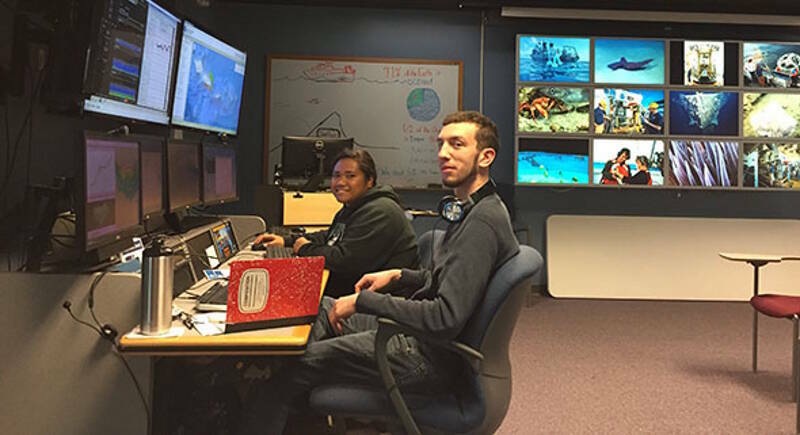 Two Explorers-in-Training, including one regional student from the Community College of American Samoa, are based at the UNH CCOM ECC during this cruise, focusing on learning daily ship operations and how to log and process multibeam sonar data. During the second component of their training with the Okeanos mapping team, they will sail in August on the Okeanos during a 24-hour mapping cruise at the Musician Seamount chain north of Hawaii. Over the last 10 field seasons, the Okeanos mapping team has hosted over 100 Explorers-in-Training, teaching valuable remote sensing, sonar, and geography skills to the next generation of U.S. ocean explorers.